The next Similan Islands season starts (officially) October 15th, that's quite a way off, but early booking is always worthwhile. On the blog, we'll be featuring the different boats that we offer our customers. The Pawara was one of our best sellers last season, and will probably be a best seller again. Great boat, a price that is a bit cheaper than it could be, very comfortable, stable boat and always top dive staff to look after people. For the next season, you can book Pawara with a 10% discount if booking and paying in full before August 31st. 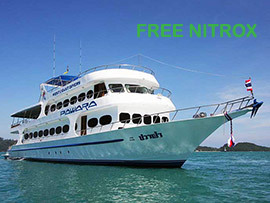 Also, Pawara is offering free Nitrox to all Nitrox certified divers for all trips this coming season! Sounds good!